Moving overseas is an exciting but intricately complicated venture. It requires significant and advance planning and research to determine exactly what's necessary to effectively execute the move. The specific regulations of your destination country as well as the length and purpose of your stay will determine the documents and paperwork needed for your relocation. As soon as you make the decision to move, you should contact your host country's consulate for more information on what is needed to obtain entry into their borders. Many countries also require all permits and visas to be in place before you can import goods or motor vehicles into their country. To get you started, this guide will provide you with a little background information on the documents you will need to move to another country. A passport is government-issued document that verifies the identity and nationality of the holder and authorizes international travel. A passport is usually required for entry into a foreign country, with few exceptions. Passports are valid for a period of five years--before making an international move, verify that your passport is up-to-date and will not expire soon after you arrive. Some countries will not permit entry if your passport will expire during the intended period of your stay. Make sure all family members have valid passports as well. 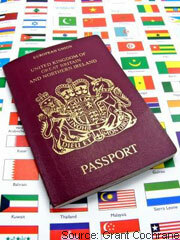 If you are not currently a passport-holder, begin the process of application at least several months before you move. The procedure for obtaining a passport can take several weeks/months to complete. You can get a passport at your local post office or library. Be sure to bring an acceptable photo I.D. (driver's license, military I.D., government I.D. card, etc.) birth certificate, and your Social Security number. You will need to fill out the appropriate form (form DS-11), available on the U.S Department of State's Bureau of Consular Affairs website. You will also need a valid photograph. Passport photographs must adhere to strict regulations--visit the Department's website for more information. There is a required fee for obtaining a passport--the amount will vary depending on if you need a passport card and book, or just the card. Visit the Department's website for more information on fees. A visa is authorization by the government of your destination country that permits you to remain within its borders for a specified purpose and period of time. A visa may be issued as a separate document, or stamped onto your passport. There are many different types of visas, and the kind that you need will depend on the country you are moving to, the length of time you intend to remain there, and the purpose of your stay. Some of these include: short-stay visa (tourist visa, transit visa, business visa, medical visa) long-stay visa (for longer, but still finite stays), and residence visa (for those seeking long-term residence). Most European countries do not require a visa for tourist or business-related visits less than 90 days, while many other countries do. If you plan to visit your destination country several times to prepare for your move--to search for housing and familiarize yourself with the area, otherwise known as a "scouting visit"--you may need a tourist visa or no visa at all. Consult the country's consulate office for more information on visa requirements for short stays. 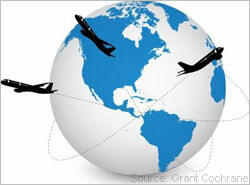 Most countries require a visa if you intend to take up residence, conduct business, or begin employment in the country. However, a visa does not necessarily authorize the holder to work in the country--you may need to acquire an additional work permit or work visa. A visa will be issued by the consulate office of your destination country located in your home country. You will usually need to obtain your visa prior to relocating--however, it may also be acquired at the port of entry depending on the country. In addition to your passport and visa, you will usually need a work permit to begin employment in your new country. If you are relocating for a job, your employer can usually provide assistance in obtaining your permit. Depending on the country, work permits can be difficult to obtain. Some countries only allow one spouse to be employed, and will not permit both you and your wife/husband to acquire permits. If your spouse intends to work as well, be sure not to list them as a dependent on your own work permit or any other documentation. Regulations for receiving a work permit will vary depending on the country you are relocating to. Get more information on the regulations and entry requirements in your destination country by speaking with the nation's consulate office located in your home country. Make sure you carry multiple copies of these documents, and do not pack them with your goods to be shipped by the international movers. Pack them with your luggage to be taken with you on the plane--preferably in your carry-on to ensure that they do not become lost during your travel.